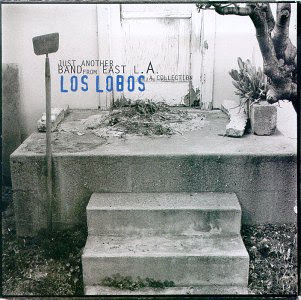 Just Another Band from East L.A. - A Collection is a compilation album by Los Lobos released in 1993. All songs by David Hidalgo and Louie Pérez, except where noted. 2. "El Cuchipe" (Orozco/Bueno) – 2:19 - From the Album "Los Lobos Del Este De Los Angeles"
3. "La Feria de la Flores" (Jesus Monge) – 3:49 - From the Album "Los Lobos Del Este De Los Angeles"
4. "Sabor a Mí" (Alvaro Carrillo) – 3:40 - From the Album "Los Lobos Del Este De Los Angeles"
6. "Anselma" (Cesar Suedan/Guadalupe Trigo) – 3:08 - From the Album "...And a Time to Dance"
7. "Will the Wolf Survive?" – 3:43 - From the Album "How Will the Wolf Survive?" 8. "A Matter of Time" – 3:48 - From the Album "How Will the Wolf Survive?" 10. "Don't Worry Baby" (Cesar Rosas, Louie Pérez, T-Bone Burnett) – 2:46 - From the Album "How Will the Wolf Survive?" 11. "One Time One Night" – 4:48 - From the Album "By the Light of the Moon"
12. "Shakin' Shakin' Shakes" (Cesar Rosas, T-Bone Burnett) – 4:10 - From the Album "By the Light of the Moon"
15. "Tears of God" – 3:45 - From the Album "By the Light of the Moon"
16. "Set Me Free (Rosa Lee)" (Cesar Rosas, T-Bone Burnett) – 3:35 - From the Album "By the Light of the Moon"
18. "La Bamba" (arranged and adapted by Ritchie Valens) – 2:52 - From the Soundtrack for "La Bamba"
19. "El Gusto" (Elpidio Ramirez)– 2:56 - From the Album "La Pistola y El Corazón"
20. "Estoy Sentado Aqui" (Cesar Rosas) – 2:27 - From the Album "La Pistola y El Corazón"
21. "La Pistola y el Corazõn" - 3:28 - From the Album "La Pistola y El Corazón"
22. "I Wanna Be Like You (The Monkey Song)" (Richard M. Sherman/Robert B. Sherman) - 3:17 - From the Compilation Album "Stay Awake: Various Interpretations of Music from Vintage Disney Films"
1. "Someday" – 3:42 - Outtake from "The Neighborhood" Sessions. 2. "Down on the Riverbed" – 4:05 - From the Album "The Neighborhood"
3. "Be Still" – 3:34 - From the Album "The Neighborhood"
4. "The Neighborhood" – 4:07 - From the Album "The Neighborhood"
5. "I Can't Understand (Cesar Rosas, Willie Dixon) – 3:57 - From the Album "The Neighborhood"
6. "Angel Dance" – 3:12 - From the Album "The Neighborhood"
8. "Saint Behind the Glass" – 3:15 - From the Album "Kiko"
9. "Angels with Dirty Faces" – 4:02 - From the Album "Kiko"
11. "Kiko and the Lavender Moon" – 3:35 - From the Album "Kiko"
12. "When the Circus Comes" – 3:15 - From the Album "Kiko"
14. "Bella Maria De Mi Alma" (Robert Craft, Arne Glimcher)– 4:26 - From the Soundtrack For "The Mambo Kings"
16. "Wrong Man Theme" (Los Lobos) – 1:45 - From the Television movie "The Wrong Man"
17. "Blue Moonlight" – 3:46 - From the Television movie "The Wrong Man"